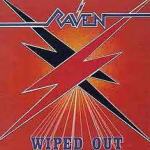 Share the post "Album review: RAVEN – Wiped Out"
Formed in the north of England in the mid 70s by brothers John (bass, and vocals) and Mark (guitar) Gallagher, Raven were a trio associated with the New Wave of British Heavy Metal. Playing what they branded as athletic rock, Raven (and similar bands like Jaguar) were a strong influence on thrash and subsequent speed metal scenes. Their 1981 debut Rock Until You Drop appeared in 1981, and this 1982 follow up rocked just as hard and fast. With Rob Wacko Hunter on drums (completing the ‘classic’ line-up), this album is a real corker and essential listening for even the most casual metal-head or guitar shredder. With a buzz build, ‘Faster Than The Speed Of Light’ then does what says on the tin, let the ear splitting begin. There’s many a chunky (even occasionally boogie) rhythm under the shred, the guitar and vocals are often high and fast, soaring like a fighter jet. Stand out track has to be the classic and catchy ‘Live At The Inferno’ (the band even named a double live LP after this song, and a classic set that is I can tell you). This entry was posted in ALBUM REVIEWS, ALBUM REVIEWS (Mobile), All Posts, Reissues and tagged album, hard rock, heavy metal, metal, NWOBHM, RAVEN, re-issue, review, Wipe Out. Bookmark the permalink.